This piece was produced in partnership with LA School Report. 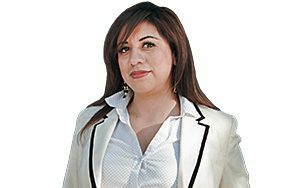 How important is K-12 public education to California voters as they choose a new governor this year? Very. And that sentiment is growing. Nearly two-thirds — 64 percent — of likely voters in a new survey called education “very important,” an increase from 58 percent four years ago when the same question was asked. A full 90 percent said candidates’ positions on education are important to them. 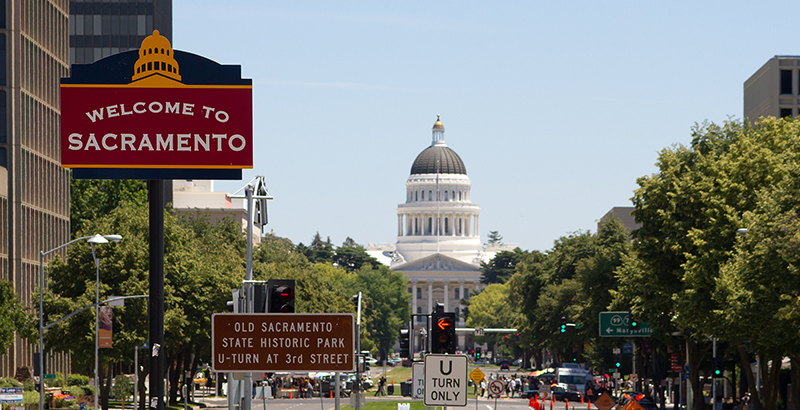 The Public Policy Institute of California’s Californians & Education statewide survey, released last week, covered education topics including political races, perceptions of schools, the California School Dashboard, and immigration concerns. PPIC has conducted its annual K-12 survey since 2005. “Despite a rancorous political climate, majorities across party lines agree that the candidates’ positions on K-12 public schools are very important in deciding whom to support,” Mark Baldassare, PPIC’s president and CEO, said in a statement. 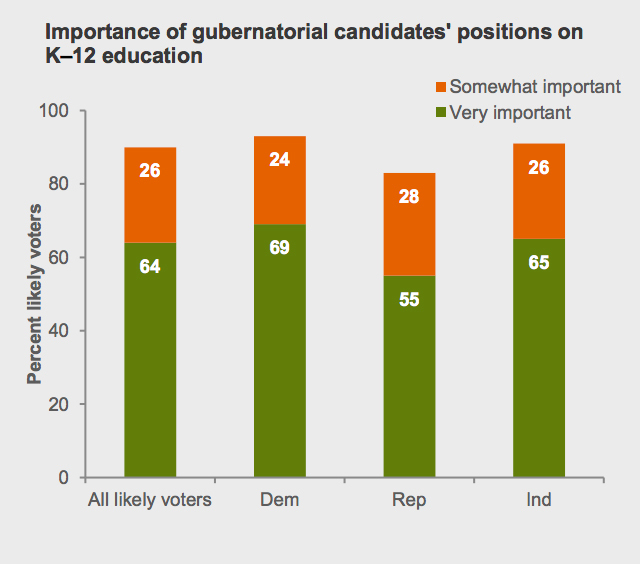 “The proportion of likely voters who said that the candidate’s position in K-12 is very important to them when thinking about the governor’s race is overall steady but has increased from 2010,” Lunna Lopes, a PPIC survey research associate, said in an interview. When asked, “If the June primary for governor were being held today, and these were the candidates, who would you vote for?” 26 percent of respondents said they would give their vote to Gavin Newsom, 15 percent to John Cox, 13 percent to Antonio Villaraigosa, 10 percent to Travis Allen, 7 percent to John Chiang, and 6 percent to Delaine Eastin. The survey also found that an overwhelming percentage of likely voters are undecided about who they will vote for in the nonpartisan primary election for state superintendent of public instruction. Three-quarters said they didn’t know. Among the other respondents, Tony Thurmond and Marshall Tuck tied with 13 percent each. California parents had an overall positive perception of their local public schools. When asked how they would rate the quality of public schools in their neighborhood, 34 percent of all respondents gave their schools a B. Those who gave their schools an A grade increased to 20 percent, up from 16 percent five years ago. Among public school parents, those percentages were even higher. The gap is similar to a significant disconnect in how parents think their children are doing in school versus reality. A national survey last year by Learning Heroes, a Washington, D.C.–based nonprofit, found that 9 in 10 parents think their children are performing at or above grade level in math and reading. But results from the National Assessment of Educational Progress, known as the Nation’s Report Card, reveal that only 1 in 3 U.S. fourth- and eighth-graders are proficient in reading, and this year’s results, released last week, were mostly flat. For the first time, the survey included a question about the access parents have to schools and the quality of schools. Unexpectedly, Lopes said, an overwhelming majority — 83 percent, or more than 8 in 10 public school parents — said they feel they can easily find information about the quality of their child’s school. But over half of them — 56 percent — have not heard at all about the California School Dashboard. The state’s new color-coded school assessment tool uses multiple measures to evaluate how K-12 schools are performing. Another new question in this year’s survey was what kind of school parents would pick if there were no issues of cost or location. Considering all things equal, 35 percent of parents would pick a public school, 31 percent would pick a private school, 18 percent a religious school, and 13 percent a charter school. “This is the first time we asked this question. It is a national question, being asked last year by the Phi Delta Kappa/Langer Research national survey, and they got pretty similar results to what we found,” Lopes said. She explained that this fits with people’s overall positive perception of their local schools. Other new information in this year’s survey, and an expected result, was that 82 percent of parents said they’re concerned about the threat of a mass shooting in their local schools. The survey started the day after the March for Our Lives demonstrations across the country that were spurred by February’s school shooting in Parkland, Florida. But 68 percent of parents opposed allowing more teachers and school officials to carry guns in schools. The survey also revealed concern about the impact of immigration enforcement in public schools — 70 percent of respondents said they were very or somewhat concerned that federal immigration enforcement will affect undocumented students in local public schools and their families. The PPIC statewide survey questioned more than 1,700 California adult residents from March 25 to April 3, in English and Spanish, on different education issues.